The title "Watchmen at the Gates" derives in part from the book by Mariana Tax Choldin, "A Fence Around the Empire." Even though there was indeed a fence, there remained ways in and out - the gates - and people who had to guard them. Purpose of the exhibit 1) To show the three legs of the Imperial Russian foreign-books-and-periodicals censorship tripod (Customs, the Foreign Censorship Committee and the Postal Censorship) and the kinds of literature imports against which they were targeted; 2) demonstrate the sweep and pervasiveness of the censorship by providing examples of the individuals and institutions that were subjected to such scrutiny; 3) examine the quirks and foibles that reduced the effectiveness of this censorship and put the government at odds with its citizenry and foreigners in the country, and 4) present a large, nearly comprehensive selection of censor marks and notations. Significance of the exhibit. This is the first multi-frame exhibit to be devoted strictly to these particular civil censorship entities, although such material has been shown in a few exhibits at the national and international level as a small or incidental part of a larger theme. Insofar as the topic is concerned, Watchmen illustrates a century-long attempt at population thought control, the effort by Russian autocracy to prevent the spread of "harmful" foreign ideas and mores via the import and postal channels within its empire and combat any attempt to overthrow it. That the attempt was a self-evident failure was readily acknowledged by many of the censors and higher authorities themselves, but bureaucratic inertia preserved the "Postal" Censorship and Foreign Censorship Committee for many decades as if they were suspended in amber. For any bureaucracy anywhere to survive essentially unchanged and un-reorganized for at least 86 years (1828-1914) is truly remarkable, but that is what happened. The exhibit also offers a look at the great Hobbesian dilemma confronting any authoritarian state that seeks to exercise control over the flow of information and ideas, which is this: A postal system is necessary for the state bureaucracy to communicate either within itself or with the population it commands, and that postal system is also fundamental to the development of commerce and social interaction. In so doing, however, the Post can also serve as a conduit for information that is deemed dangerous by the state. The more control (censorship) is exercised over that conduit, the more development is retarded and the more the state is weakened economically and socially. Conversely, the less control is exercised, the more the state is weakened politically as its population gets information from other sources, and the state begins to lose its authority. 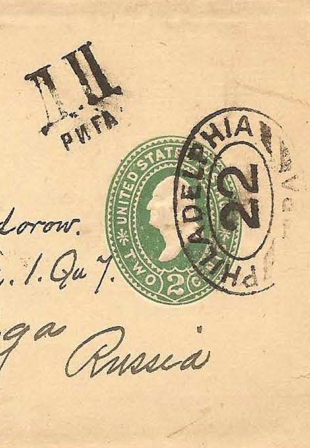 Imperial Russian control of that conduit took both overt and covert form: overt, announced by censor markings applied to people's mail, and covert, conducted by the so-called "black chambers" that were usually co-located with the overt mail censorship offices.